The GPS settings integrated in our new taxi app is suitable for faster and accurate transportation. This is equally beneficial for the driver, passenger and back-end admins. The exact location of passengers can be identified by the drivers easily. The Google/iOS navigation module which is embedded in the mobile app helps in supervising the movement of taxis along the map by the admin panel. The passengers can view the complete route map while the trip is made. An ideal and flaw-less navigation is made possible by GPS facility. Live monitoring of ongoing rides with location updates using GPS. Advanced passenger location system and pickup location is automatically set. Real-time updation of changes in location after instantly checking and verification. Possible to suggest alternate routes after viewing in the map displayed. Google/iOS navigation module for ensuring compatibility in multiple platforms. When a passenger request has been accepted, the automated payment system starts functioning. 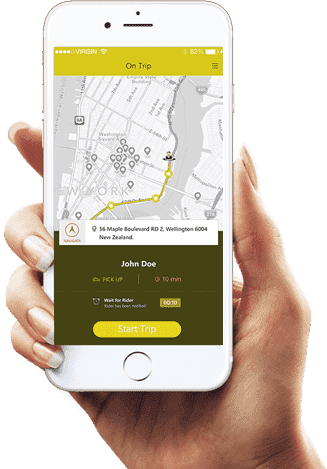 It identifies the location of destination, checks for the route and automatically estimates the fare for the trip. The fare is calculated based on the time, distance between pickup and destination location with the help of GPS. However, this varies depending upon the location of the trip (city), alternate route chosen and waiting time, if applicable. Exact fare, time and distance will be displayed in the fare meter instantaneously at every moment and billing is automatically processed. Automated fare estimation increases accuracy and reliability. Fare is precisely calculated by automatically checking distance and time taken. Real time movement is tracked using GPS and charge is automatically revised. Based on unique trip ID, passenger can review the fare anytime from the mobile app. Based on the driver and passenger location updates, instant notifications are generated. Any passenger can login and mark his pickup location for sending a trip request. Then notification is passed to the nearby drivers and they can view it instantly if they are online. Push notification is sent for the drivers for accepting the ride request in case if app is in minimized state. When the driver accepts the ride request, passengers are notified. SMS and push notifications are sent to passengers and drivers simultaneously throughout the trip for better communication. Instant notification system helps to achieve a faster service. Location based updates of driver is collected using GPS and alerts sent to passenger. Systematic management for sending E-Mail, SMS and In-App notifications. Notifications are sent after every financial transactions are completed. At the time of registration, one time authentication of credit card / paypal details is done. The required financial details are added in the new taxi app for future payments. This enables automatic payment processing later whenever a taxi service is accessed. The transactions are strictly privacy protected and the details are securely saved in our database. After each trip completed as per passenger request, the estimated amount is automatically withdrawn from their account. The payment is processed for drivers in a weekly basis. Each time the payment is made, E-receipts are generated & sent to the passenger. Efficient management of the financial transactions is ensured. One time authentication of banking details allows future payments. Credit Card/ Paypal online payment integration for secure access.